Two days ago, I explained that tax increases are bad policy. More specifically, I warned that giving more money to government exacerbates fiscal problems because politicians respond to the expectation of more revenue by spending more than otherwise would be the case. And since they usually over-estimate how much revenue a tax hike will generate, that creates an even bigger fiscal mess. Not surprisingly, I cited Europe to bolster my case. The tax burden has increased enormously in Europe over the past several decades, but that obviously hasn’t prevented a fiscal crisis in nations such as Greece and Portugal. And tax hikes haven’t precluded deteriorating conditions in countries such as Belgium and France. But I also cited Illinois, which just got downgraded by Moody’s – even though state politicians just imposed a record tax hike. In other words, his post confirms my point about higher taxes translating into higher spending. He openly admits that the tax hike was a substitute for spending restraint. What makes his concession so remarkable is that my argument wasn’t even based on one-year fiscal decisions. 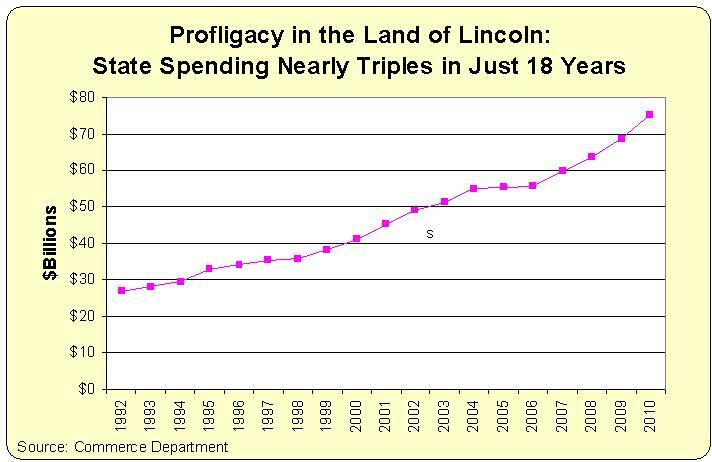 I”m much more concerned with trend lines, and you can see from the chart that Illinois politicians have been promiscuously profligate in recent years. Indeed, I developed “Mitchell’s Golden Rule” to underscore the importance of restraining the burden of government so that, over time, it grows slower than the private economy. That obviously hasn’t been happening in Illinois in recent decades – and it’s not likely to happen in future decades if politicians figure out ways of grabbing more revenue. Well, I don’t know about you, but this is not exactly a rigorous rebuttal. He doesn’t provide a revenue forecast from the pre-tax-hike era or a more recent forecast from the post-tax-hike era, so we can’t make any comparisons. Instead, we’re supposed to blindly accept vague assurances from some Commission. This doesn’t mean that forecasts don’t exist or that the bureaucrats were wrong about their short-run projections. But that’s not the main issue. The key question is what will happen to revenue over a period of years, particularly once entrepreneurs, investors, and businesses have time to adjust their behavior in response to the more onerous tax regime. The changes can be enormous, as demonstrated in this post showing how rich people paid five times as much federal income tax after Reagan cut the top tax rate from 70 percent to 28 percent. It will take a few years before we have a decent idea about the consequences of the Illinois tax hike. But since Illinois is copying European-style fiscal policy, don’t be too surprised if the result is European-style economic malaise. @capitolfax, the main point here is not to contest the claim that “Operational spending is down since the Illinois tax hike,” but it is to point out that if Illinois had not increased its taxes it would’ve had to cut $7 billion more from spending to balance its budget. In short, increasing taxes prevented $7 billion more to be cut. He says that initially they might be getting more revenue but as history documents, in the long term Laffer curve effect sets in. Why don’t you ‘not-so leftists’ learn anything from history? To be clear, IL borrowed in earlier years to make pension payments. After the tax hike, most of that money was used to make the payments this fiscal year. You don’t know the difference between operational spending and overall spending. The reason for your confusion is that Illinois borrowed to make its pension fund payments. Also, if you think I’m a Lefty, then you must be pretty darned far right. Corrolary: The long term Laffer curve, converges to the Rahn curve. If voters understood that, they would understand 80% of what determines their mid-long term prosperity. Everything else is pretty much details, arguing either for or against the above point. The Laffer curve often discussed, has an implied short time horizon of a few years — i.e what will happen to revenue in the next few years depending on taxation levels. It does not account for changes in lifetime choices and the relentless compounding of slow growth rates. The peak of this short time horizon Laffer curve occurs much later than the peak in the Rahn curve, the one that determines ultimate mid-long term prosperity. The peak of the short term Laffer curve represents an economy operating at the effort/reward incentives of a European style economy, riding a 1-2% annual growth trendline to economic oblivion in a world that grows 4-5% average.